♥ Silver Lining Decor Giveaway! ♥ Closed!! Do I have Another Fabulous Monday Giveaway for you! repurposing vintage jewelry into something the modern girl can wear and feel good in today! The pick your colour mum necklaces look beautiful! Ohhhhh…this is hard to decide. I could not decide between the daisy and turquoise necklace, the rose lucite earrings, or the mum necklaces. But i am thinking my very favorite are those sweet earrings. http://www.etsy.com/listing/70951255/sweet-pink-and-ivory-rose-duo-post. Everything is just GORGEOUS in this shop! Thanks for a chance to win, Keren! I also "hearted" her shop–it's beautiful! Now following her blog…thanks again, Keren! I heart her shop. I think I might be buying a few things soon. They are all fabulous pieces. I love old jewelry that's been refurbished. This was my favorite. I already have the outfit to go with it! My favorite item is the pair of light blue glass star post earrings. I tend to gravitate toward stud earrings so these are PERFECT!!! I LOVE the chunky turquoise blue bead and red flower necklace!! So pretty!! I heart her shop (curlygirl1971)! I now follow silver lining decor. I like all the colors, but especially the pinks and green! I love the mum necklace! I favorited (is that a word?) her shop. I "heart" her Etsy shop. whoa, keren! thank you for spotlighting this wonderful shop. i am loving everything, especially the sweater clips, however somehow this made me gasp a bit extra! off to favorite the shop. The chunky turquoise blue bead and red flower necklace here is adorable!!! gorgeous…hard to pick but I like this one very much. How have I missed you? Your blog is a delight! Not even entering the giveaway, but had to let you know how cute this place is! Little bits of joy are found here. I follow the Silver Lining Design blog! I am now follower of hers! Oh my goodness, I adore these aqua moonstone earrings! I absolutely love this shop! This is one of my favorites, but it was hard to pick just one. I am now following SLD's blog. I'm a Follower of SLD blog! I "HEART" SLD on etsy! 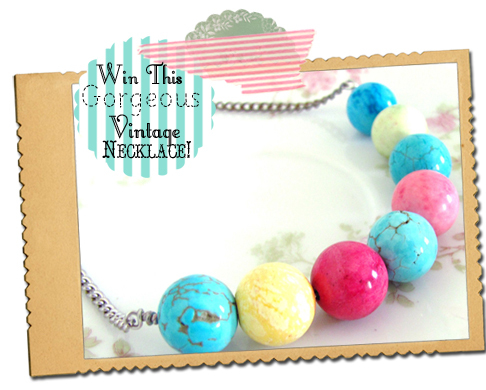 loving the chunky turquoise with red necklace!! LOVE! Well I just learned how to add a link back for etsy! Yeah for me! And thank you so much for this opportunity. Boy am I glad you sent me over there to check it out. Oh and I hearted her too! Thanks again! I'm now following SLD's blog! I now follow her lovely blog! Which I'm glad to have found, thanks! I love vintage inspired and turquoise!! Oh how will I ever decide?! Aren't those colors just stunning together?! I love so much of her stuff! The Vintage Aqua and Lime Cluster Necklace is a wow for me though. I hearted Silver Lining on Etsy!! This pearl cluster necklace is gorgeous! Very vixen! is my favorite.Thank you for including me in the giveaway. I joyfully "heart" Silver Lining Decor. I just became a follower of Silver Lining Decor. It fuels my spring fever! I am SO in love with almost every piece in her etsy shop. Adorable stuff! I think this necklace would go with everything! Gosh, what beautiful jewelry!!! It's so hard to pick a favorite, but I fell in love with the Vintage Gold Bow Double Pink and Natural Glass Pearl Asymmetrical Necklace! Thanks, Keren, for this wonderful oppt'y. to enter! Wow, Love this stuff. I adore those chunky pink glass earrings. I will definitely be ordering from her shop soon! She's now added to my new favorites and I will be following her blog. I love the turquise chunky bead necklace with flower! Love all the bright colors and would love to win. I love these earrings b/c I love bows and the color combo. However, everything in the shop is too cute. I also <3ed the shop! i love these earrings, so bright & cheerful & springy!!!! I'm also following the SLD blog. I'm following the Silver Lining Decor blog. I just found your blog and do love all your pretty things. This necklace would be perfect for summer and also love the coral bird necklace. It was so hard to decide, but I LOVE this chunky neclace! I hearted the SLD Etsy shop.